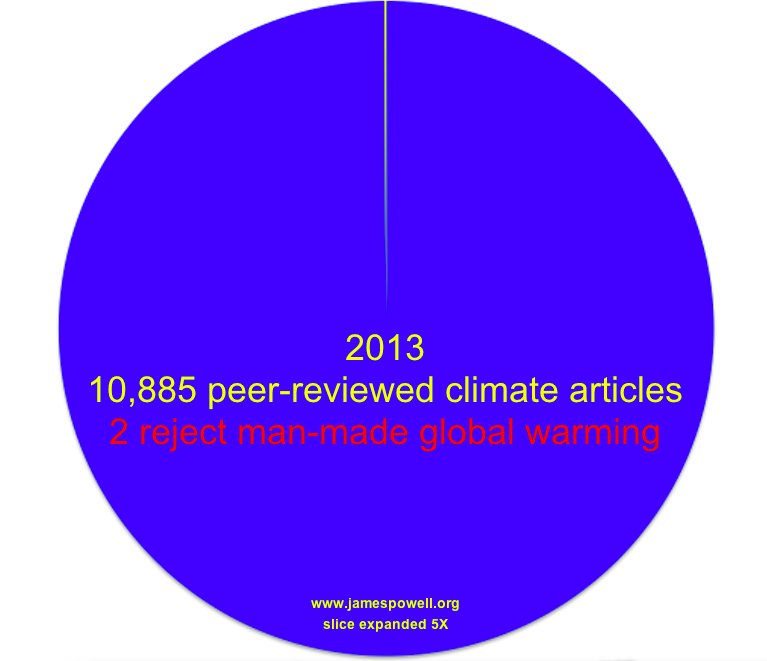 Powell even had to expand that itty bitty slice of the consensus pie five times for us to make it out -- the actual doubt about climate change within the scientific community is even tinier. Very few of the most vocal global warming deniers, those who write op-eds and blogs and testify to congressional committees, have ever written a peer-reviewed article in which they say explicitly that anthropogenic global warming is false. Why? Because then they would have to provide the evidence and, evidently, they don't have it. UPDATE 3/26/2014 9:27 PM: The headline of this post has been corrected to reflect the correct number of articles referenced by Dr. Powell's research. Powell also clarifies that many of those studies were authored by multiple scientists, so the complete number is actually higher. The headlines has been updated to reflect this as well. On his methodology, Powell notes, he only verified that two out of the 10,885 articles he found concluded that anthropogenic global warming (AGW) is wrong: "It is a safe assumption that virtually all the other 10883 do not reject--that is, they accept--AGW but I can't say for sure that each one of them does."